MagVigen™ Protein A nanoparticles are ideal for antibody purification and immunoprecipitation assays. MagVigen™ Protein A nanoparticles recognize and efficiently bind to the Fc part of immunoglobulin (Ig) following a short incubation. The generated nanoparticle-antibody complex can be separated from the rest of the sample by magnet. The retained antibody can be eluted from the nanoparticles using an elution buffer. 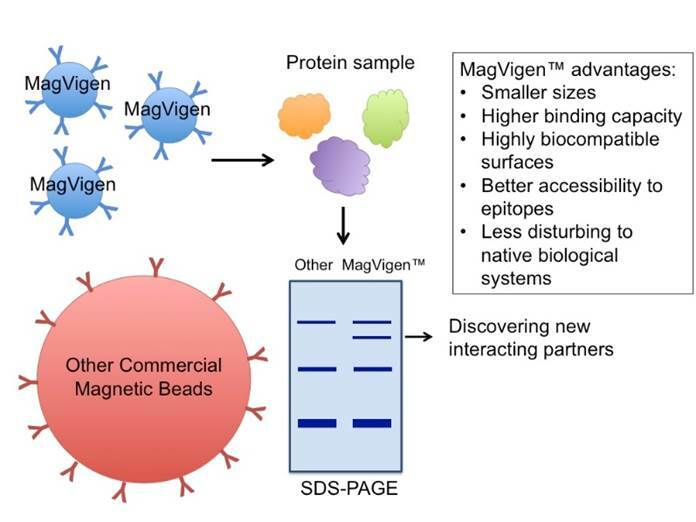 MagVigen™ nanoparticles enable identification of new protein-protein interactions through immunoprecipitation assays, where the MagVigen™ Protein A-antibody complex can be used to isolate particular proteins of interest or protein complex from assay samples, e.g. cell lysate. The immunoprecipitated proteins can be further analyzed by electrophoresis, protein staining, and mass spectrometry. MagVigen™ nanoparticles are much smaller than conventional micro-beads. This feature allows for better accessibility of the nanoparticles to the antigenic epitope and for less disturbance to the native functions of proteins or protein-protein complexes. In addition, the surfaces of MagVigen™ nanoparticles are uniquely coated to reduce non-specific interactions with cellular proteins and other biomolecules. This feature allows for a more specific “pull down” of real protein complex targets. MagVigen™-Protein A nanoparticles are provided in phosphate buffered saline (PBS) containing 0.05% NaN3, 0.01% Tween 20. pH 7.4. For optimal results from the nanoparticles, it is recommended that the nanoparticles are washed prior to addition to samples. Take 50μl of nanoparticle solution, add it to 100μl 1X Washing Buffer, and vortex to mix. Add 50μl of MagVigen™ nanoparticles into 500μl of cell lysate and incubate on ice for 30min. Separate the nanoparticles from cell lysate by placing the magnet on the side of the tube for 2-5 min and collect the supernatant carefully and transfer to a new tube. Add 5μg of antibody (or recommended amount following company protocol) to the tube containing precleared lysate. Incubate on ice for an hour. Add 50μl of MagVigen™ nanoparticles to the tube. Rotate for 2 hours at 4°C. Separate the nanoparticles from sample solution (cell lysate) with magnet. Remove supernatant. Wash the nanoparticles 3 times with 50μl of lysis buffer used. After the last wash, remove the supernatant and add 100μl of elution buffer to the beads. Vortex and incubate for 5 minutes.